Today Mother Church has been celebrating the feast day of St. Ambrose, a Roman nobleman. He was governor of Milan and Converted to Christianity sometime around 350. He was ordained in 374. Pope Boniface VIII proclaimed him a Doctor of the Church and he was dubbed “The honey-tongued doctor” since he was a very gifted preacher. Well, that’s the popular understanding, anyway. One story suggests that Ambrose as a baby was lying down in his crib and a whole bunch of bees flew around him. They didn’t sting but rather gave him a drop of honey. Ambrose’s father felt this was God informing him of Ambrose’s future. Ambrose’s words could sting…in a good way. That is to say, he compelled people to conversion by means of his words. This distinction–the honey-tonged doctor–has led to many fascinating practices with bees and images of bees. For instance, St. Ambrose University in Davenport uses the mascot of the “Fighting Bee.” There is a place on campus called the “Beehive” where students routinely gather. 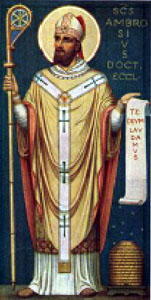 It is not unusual to see an image of St. Ambrose with a beehive at his feet. See image above. One parish in Baltimore under St. Ambrose’s patronage has a fundraiser involving honey imported from a nearby beekeeper. The parish routinely sells jars of honey, blessed by the pastor, with a tag explaining the story of St. Ambrose and just a bit of info about the parish church. Truth is, the pastor says, it doesn’t generate much money; its primary goal is to “get people buzzing.” It seems to work. Would that I had some honey right here! My dad was a proud graduate of St Ambrose in Davenport. He got a great liberal Arts Education there from some wonderful priests and some wonderful Lay people.